This is a race I’d had my eye on for a number of years but never seemed to get round to entering. This year, with me being home alone as the family went away on holiday, it fell perfectly for me to run the race then have time to get home, changed and be back at the airport to pick them up later that evening. 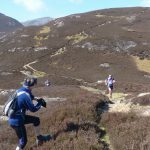 At 38 miles, Jedburgh 3 Peaks is a pretty serious race – but only in distance. From an organisational point of view, this is as fun as it gets. From the encouragement to wear fancy dress for the opportunity to win a spot prize to the YMCA warm-up ahead of the start, this race is a lot of fun. This is very much like the Hardmoors Princess challenge but with unicorns! With my alarm set at 4 am, I set off on the long drive up to the Scottish Borders. The morning was cold and the first snow of the winter was falling quite heavily as I drove up the A19, which was a little disconcerting. Upon arriving at the rugby club in the centre of Jedburgh, it struck me as to just how cold it was going to be, so I immediately put on an extra layer then headed to registration. Before long we were all back outside at the start-line waiting to get going, but not until we were all made to dance the YMCA as part of the pre-race warm up. Such was the silliness that I forgot to set my watch and before I knew it we were off on the long run up the road and out of the town. After a mile or so the route swings out to the river which is followed for another mile or so before crossing a very bouncy bridge which felt as though it was winding up to fling-off anyone who dared try and run across it. The route then meandered its way across fields and tracks and back along the riverside for a few miles, mainly following the St Cuthbert’s Way route. The recent high winds had felled a lot of old trees, which provided obstacles for us to negotiate. The day was bright and the sky was clear and blue, but there was a bracing wind and it was extremely cold in the shade. 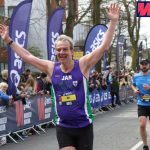 I tried to maintain a very steady pace and not get carried away by running too fast on what was a fairly flat and very runnable surface. I’d set myself the goal of completing the race in 8hrs. This was a very comfortable amount of time for the distance but meant I could enjoy the race without overcooking it. Given how badly I’d crashed in my other races this year, this was all about pacing and keeping my heart rate low. The route was proving to be quite spectacular in the cold late autumn sun and the colours of the leaves added to the overall beauty of the route. The lack of rain over the summer meant sections that would normally have been a quagmire were fairly dry which those veterans of the race around me commented on. I didn’t stop at the first checkpoint at Maxton Church, but continued my run over fields, along tracks, through plantations and across roads until eventually reaching the second checkpoint at Rhymer’s Stone where I had a drop bag waiting with some supplies such as a milkshake and a few energy bars. 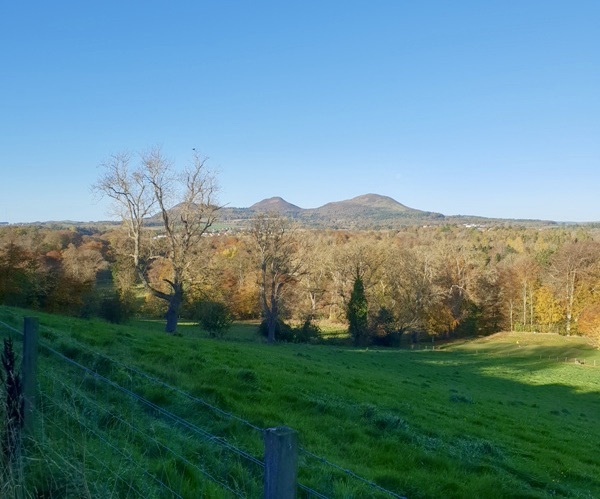 I grabbed my bag, stashed my food and drinks and made off as quickly as possible as now, up ahead, were the Eildon Hills which form the 3 peaks in this race. At the foot of the first, I looked up to see a long line of runners making their way up the side. I joined in the trudge up the steep climb until eventually reaching the summit. Ahead lay the second and third peaks, which got respectively lower. I made my way across them before dropping off the third and circling back around underneath them and into the woods that leads to the third checkpoint at Bowden and the ‘Play Park of Doom’! Silliness is dished out by the bucket load at Bowden where, following an ambush by someone dressed as a bat (or at least I think that’s what it was), runners are funnelled into the play park where they must negotiate the obstacles which are essentially the climbing frames and slides of a children’s play park. From Bowden, the route retraces its steps back to the finish and I was running well at this point and really enjoying the race. I was still making good ground on those that had been drawn into running too fast at the start but always conscious not to get carried away. 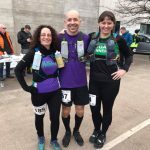 The run back was pleasant and I arrived back at the final checkpoint at Maxton to grab my last drop bag which had a few treats in to see me through the last 10 miles. I’d been starting to tire in the run back here so I set off at walking pace to try and conserve a little energy. The route, back retraced our steps from the start of the race and before long I was heading back across the bouncy bridge for the final few miles back into town. I shuffled my way up the road with the finish in sight, which was as lively as it had been when we left. There was music playing and supporters lined the finish funnel to greet runners as they wearily made their way to the finish line. 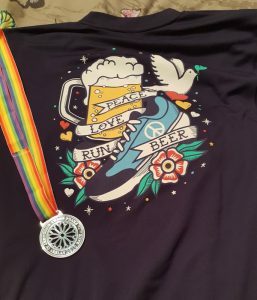 As I crossed the line I was handed my medal and a goody bag, which was probably one of the best I’ve had in a race – mainly because it contained beer and a fine t-shirt. 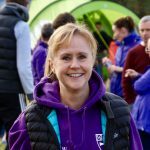 I’d highly recommend this race to anyone who is looking to step up to ultra-distance but worried about the challenge and the seriousness of the runners. This is a fun race where runners get lots of support in a beautiful part of the world.